Los Angeles, like many sprawling cities, has a lot of residential areas that run smack into major business thoroughfares. Our house, for example, is on a quiet curving street without sidewalks, full of huge trees and long driveways, but it is also a block and a half from a busy car wash, a bus stop, my office building, and two grocery stores. It is conveniently located for mass murderers and the dog park. 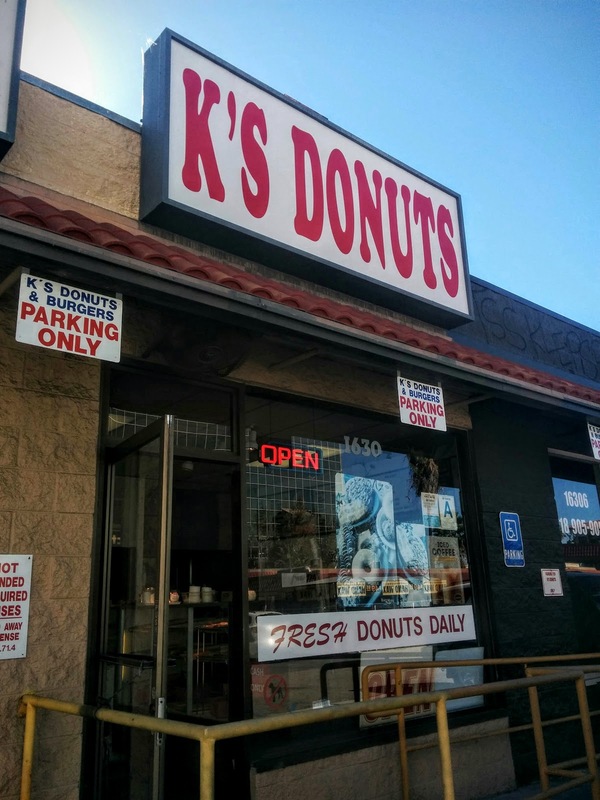 Right at the corner, tucked into the same parking lot as that car wash and an auto repair place, is K's Donuts and Burgers. I think we picked up doughnuts for the movers the day our van pulled into the driveway, and it's been a part of our lives ever since. It's a total hole in the wall, with dingy formica counters and a brusque couple working the register. It's cash only. 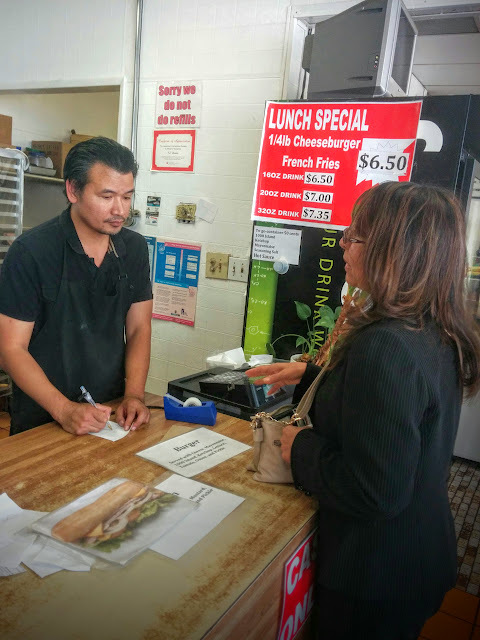 On weekdays, they make burgers and sandwiches, and the lunch special of a quarter-pound cheeseburger, fries and a soda for $6.50 is a steal. Can you get a grilled cheese sandwich? No. Is it the greatest burger ever? Nah. 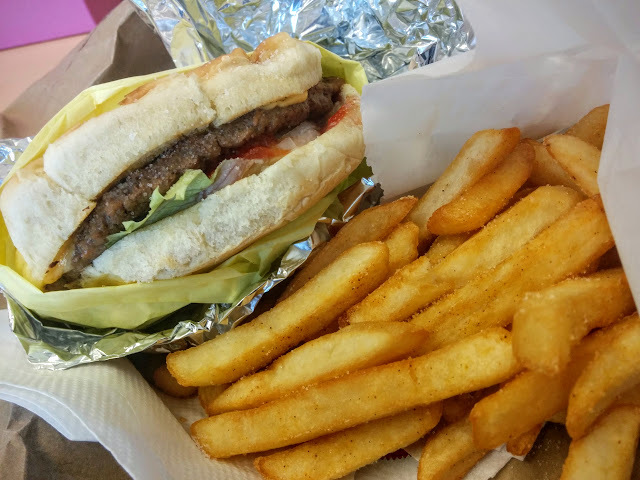 But it's grilled fresh, the fries are piping hot and perfectly salted, and it's $6.50 with a drink, for heaven's sake. When we first allowed the kids to leave the house on their own, it was to walk to K's with the dog and get their own lunch. They'd return home, clutching the brown paper bag, supremely proud of themselves not only for the solo outing, but for managing the wad of seven ones we'd given them so proficiently. Later, when they were starving after school, it was always a rush to try and get there before the grill closed at 4 o'clock. 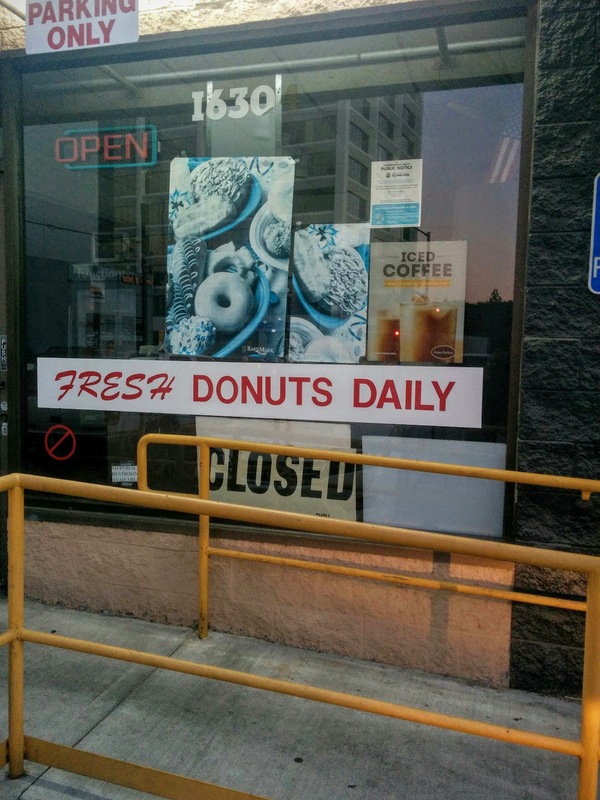 The lunch special is a deal, but the doughnuts are magic. The glazed old fashioneds, shown here, are my gold standard for what that doughnut should be. Slightly tangy from the buttermilk, tender on the inside, crispy on the outside. Man! So great. Rumor has it they use the original Stan's recipe, which makes it even more of a miracle for us to have them here in this nondescript strip of Encino. 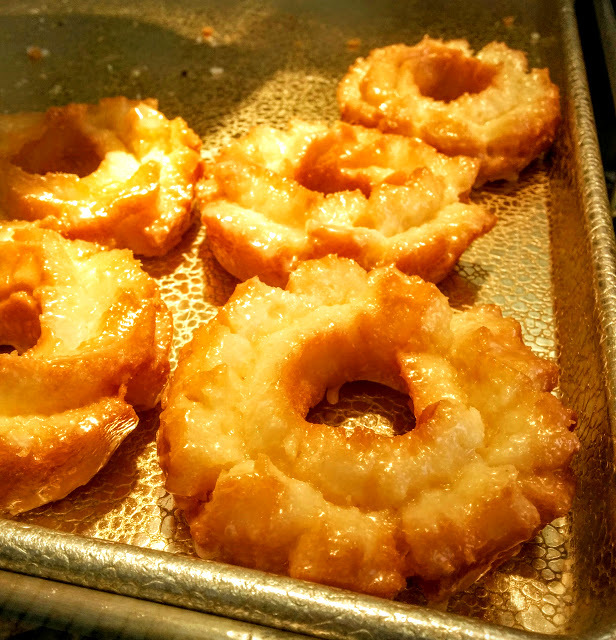 I've talked about K's doughnuts here on the blog more than once. Leaving early for Disneyland? Stop at K's. First day of a new school year? Stop at K's. My son even ran into the headmaster early one morning as they both lined up for fresh doughnuts. 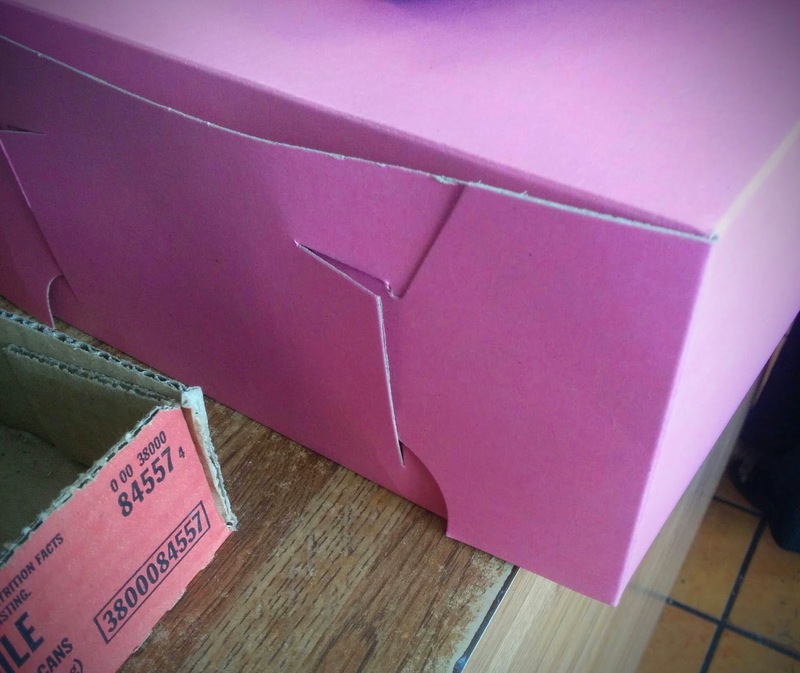 Our office countertop was graced with a bright pink box on more mornings than I can count over the past four years, and we were all the happier (if a little heavier) for it. 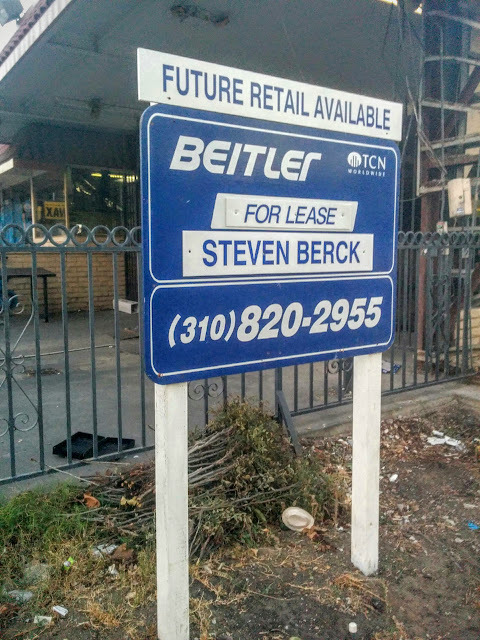 About a month ago, the car wash suddenly closed, and a chain link fence appeared around the driveway. The auto shop, never all that busy, shuttered. A developer had purchased the lot, and was rapidly pushing the tenants out to make room for yet another cookie cutter apartment complex on a street already riddled with them. The owners at K's vowed to stay put, and we cheered, hopeful and glad that the little guy was going to win the day. But then they didn't. Today was K's last day. The shop was packed. Firemen, employees from the grocery store, nurses and doctors, plumbers and practically our entire office all made the pilgrimage to grab a burger, a tuna sandwich, a box of fries, and the last maple bars. 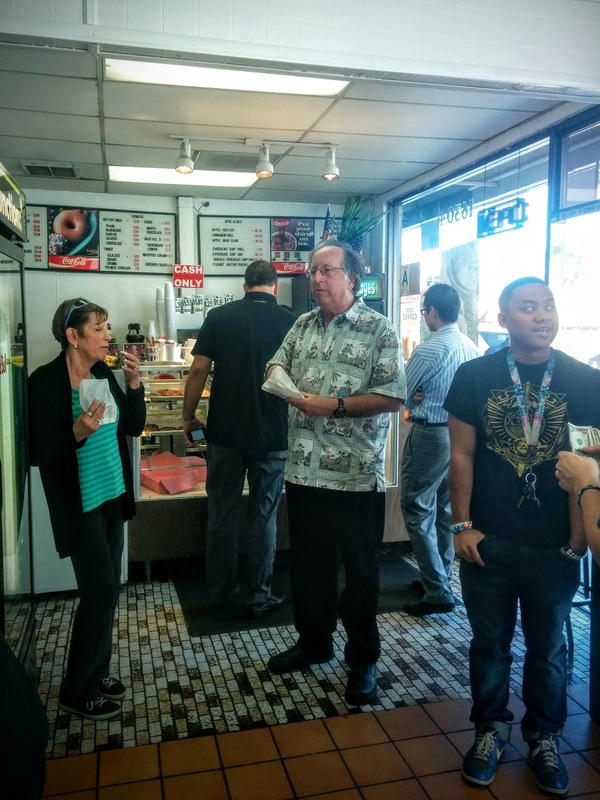 Everyone shook hands with the owners, who were still hustling and frantically calling out numbers. "Number 2? Double burger with jalapenos? It's ready!" One woman pressed her card into the cashier's hand. "When you get a new place, you CALL me. I will tell EVERYONE. You hear me? I can't believe this." * Technically, there is actually another K's Donuts two miles away, but it's not the same K's. All photos from this post were taken with my phone on my own last day pilgrimage. It's midnight, and the temperature in my kitchen right now is 82 degrees. Yes, that is correct. The absolute coolest it has been today is 82 degrees, and I had to stay awake until now to experience it. I've been "glistening" for weeks, along with the rest of LA, as Fall has apparently been kicked to the curb so that summer can just hang out here for a bit while the rest of the country gets to have soup and break out the flattering knitwear. Not that I'm bitter or anything. I just want to want to get under the covers sometime soon, that's all. In lieu of the elusive crisp autumn days, I had to settle for these crisp shortbread bars. Mind you, my idea of settling involves brown sugar, pecans, and chocolate. 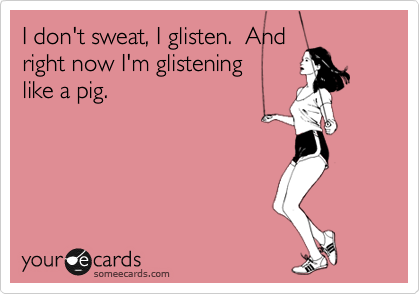 Glistening burns a ton of calories.